Chris Holtmann doesn't need you to remind him of Ohio State's three losses to Penn State last year. He had enough people reference the trio of defeats in the offseason. The Nittany Lions beat the Buckeyes in January with a game-winning 3-pointer from Tony Carr, who dropped 28 points. Carr dropped 30 points in Penn State's second win against Ohio State three weeks later, then assisted on Josh Reaves' game-winning shot that knocked the Buckeyes out of the Big Ten tournament in the quarterfinals. After nearly a year of waiting, Ohio State has its chance at redemption. The Buckeyes take on Penn State for the first time this season at 7 p.m. Thursday at the Schottenstein Center. Chris Holtmann hasn't shied away from mentioning what happened last season in the lead-up to the matchup. Though both Carr and Shep Garner are gone, Holtmann views Penn State as a similar group to the team that swept the Buckeyes last year. "They've got a large contingent of their group back from a championship team, a team that had a great year and won the NIT last year, won 25 games," Holtmann said. "Obviously, like us, they lost some integral parts, but they have quite a bit of experience returning, and those guys are really playing well right now." Can you be a team that's 1-10 in the Big Ten, but playing as well as it has played this season? If that's possible, it might describe Penn State. The Nittany Lions, just like the Buckeyes, didn't win a single game in January, but won their first game of February, beating Northwestern, 59-52, on Monday. Prior to the victory, Penn State took Purdue to overtime. Before that, it lost consecutively to Rutgers, Minnesota and Iowa by just a combined 12 points. The Nittany Lions also have a win against Virginia Tech, which has moved up to No. 11 in the country. "They're playing with a lot of confidence now," Holtmann said. "When you even look back at their Purdue game, they certainly played Purdue better than we played Purdue here. I've thought about that as I've watched them from a distance throughout the year. They've got some really good, talented players. They've led almost in every league game. A lot of those have been in the second half." Most of Penn State's wins have come in low-scoring affairs in the 50s or 60s. Opponents haven't topped 65 points in three of the past four games. "(Jamari) Wheeler gives them a defensive threat," Holtmann said. "And then I think, in some ways, you've got (Mike) Watkins and (Josh) Reaves, who are probably the most impressive defensive, or at least up there in terms of most impressive defensive duo. (Lamar) Stevens is an outstanding defender, and Wheeler is an outstanding defender. There's a reason why their defensive numbers here of late have been really good." The Nittany Lions haven't managed much efficiency on offense this year. They shoot just 40.8 percent from the field and 31.5 percent from 3-point range. Myles Dread and Rasir Bolton both hit better than 35 percent from beyond the arc on more than five attempts per game, though. Stevens leads the team with 18.9 points per game, hitting 41.7 percent of his shots from the field and 21.9 percent of his 3-pointers. Only one other player averages double-digit points per game. Stevens also averages 7.7 rebounds. "I just think (Stevens is) that versatile kind of forward who can score it at all three levels," Holtmann said. "He can post you. He can certainly make mid-range. He can make 3s. He drives it, does a great job getting to the foul line. I think what makes him such a good player is his impact on the other end, as well. He is really a tough kid, as all their kids are. He does a great job challenging guys one on one." For the first time in a month, Ohio State will play a game coming off a win. 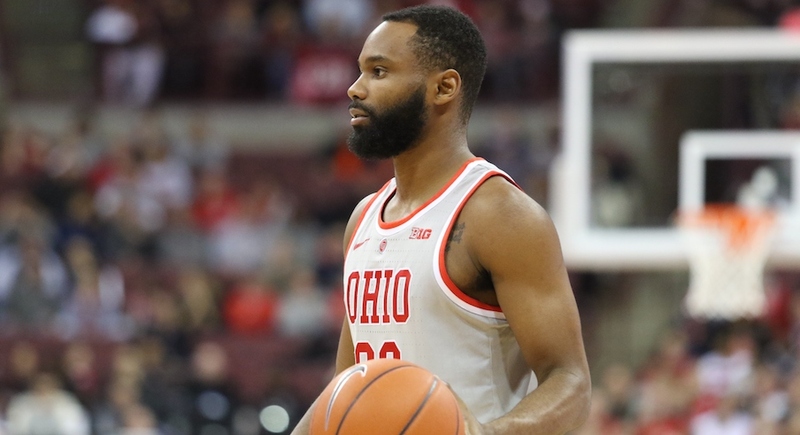 Prior to January, the Buckeyes looked in good shape, nearing locking up an NCAA tournament berth, That looks much less certain now, though projections have them making the field of 68. Games such as Thursday's become significantly more important after the rough last month. Woods has 10 more regular season games remaining in his college career, and his team's tournament hopes have remained in his mind. "I think about it, but I mean we've positioned ourselves with our out-of-conference schedule and the little bit we did do before the January stunt that we still have a chance," Woods said. "We know that. That's why you make it to February. That's why you make it to February, and that's why you make it to March. Continue to get to play. "So we make a run in February, we do our thing in March. I don't see why not we'll be able to make the tournament, and that's our approach. We can't go back and change January. It was terrible. We made mistakes. I made mistakes. We lost. But that's why you make it to February – to change the outcome." This is a must-win game for the Buckeyes, and they should pull it out. Penn State's defense could make it difficult on them, the the Nittany Lion offense is nothing special. Provided Ohio State can hit a sufficient enough amount of outside shots, it should be in good shape.